Once a upon a time, someone came up with some fashion rules. Basically unspoken rules about fashion do’s and don’ts. For a while I made sure I abided by the fashion don’ts. As I get older and got more comfortable with my personal style, I’ve been throwing these rules out the window. It felt like it limited my options and personal style. The most common fashion don’t is ‘don’t wear white after Labor Day‘. Wearing white is usually associated during the summer since wearing a white dress is prominent in the summer. In the past few years, I noticed I can incorporate wearing white in every season. I find the color white very flattering. Last Fall, I was loving the all white outfit and it was one of my most popular posts last year. And guess what, that was after Labor Day. 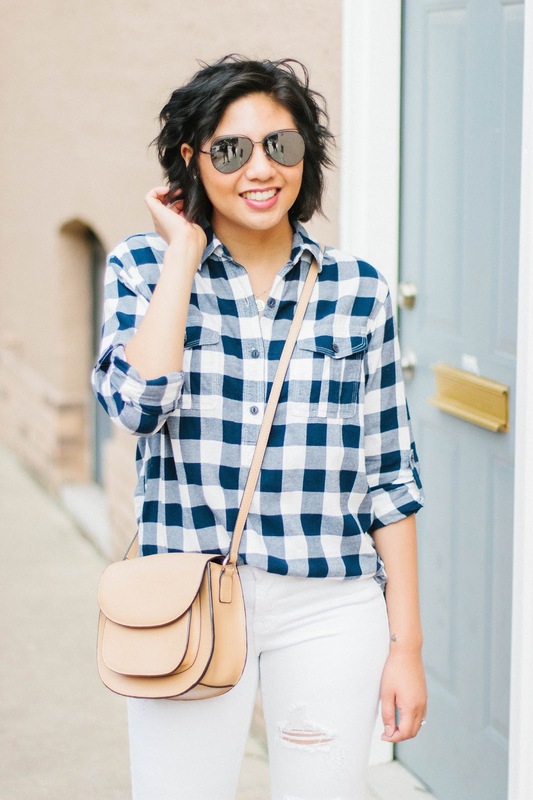 In this post I decided to wear my first white after Labor Day by wearing my favorite distressed white jeans and aviators (btw, my aviators are totally customizable!). Since the temperature is slightly cooler, I decided to pair my whites with a buffalo check shirt. I think the flannel shirt gives it a more Fall look. Without a doubt, I highly recommend wearing white after Labor Day. If you’re unsure how, here’s how I wear white after summer. If you are going to wear white after Labor Day, the best way to wear white is in your jeans. Since jeans are more appropriate to wear in the Fall (the crisp air, cooler temps make it ideal jeans weather), why not wear it in white? 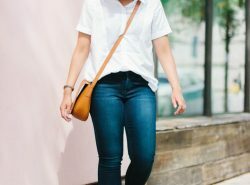 My favorite and affordable white jeans are the Rockstar distressed jeans, Topshop Jeans, and High Rise Skinny Jeans. Cooler temperatures mean it’s time for sweater weather. There are tons of cute sweaters out there and many are in the color white. This also includes cardigans. I love wearing white cardigans because they go with anything! This makes it so easy to layer, especially if you’re looking for a more transitional look. My favorite white sweaters are Crewneck sweater, Cable Knitted Sweater, and Tie-Cuff Sweater. 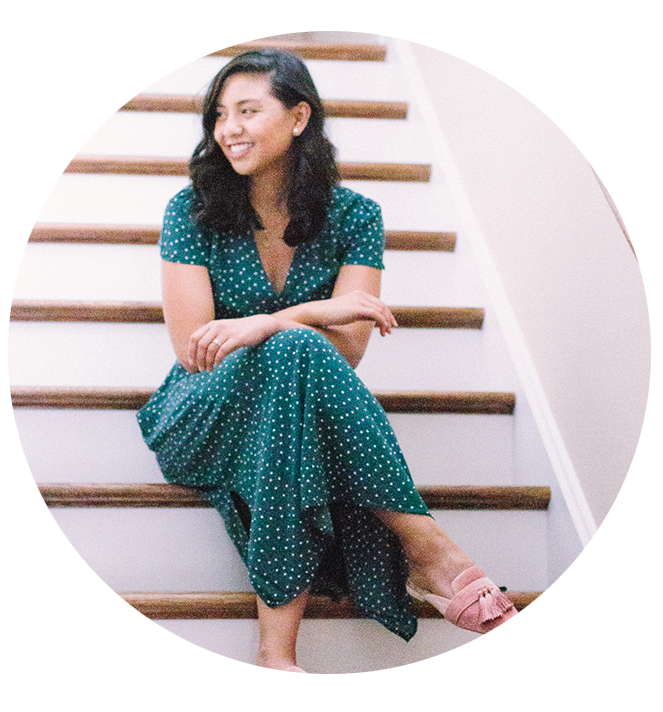 My favorite cardigans are Textured cardigan, Cardigan Sweater, and Cardigan Wrap. 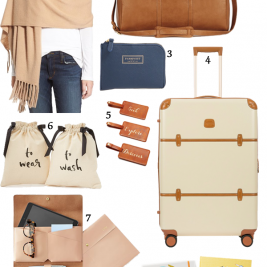 Just like the outfit in this post, pairing white with Fall colors such as navy blue, burnt orange, burgundy, olive green, etc gives it more of a cooler temperature style versus a summer feel. I love to pair white with this navy ruffled sweater, burgundy wide-leg pants, and green quilted jacket. What are your thoughts about wearing white after Labor Day? Great tips, and this look sure is gorge. Such a cute outfit and love that top! I am in love with this look! The top is my fav! Haha I like your mindset! All for the white pants! Perfect tips for wearing white and you nailed it in this look! I love the plaid. I have always worn white after Labor day. It is such a great color that brightens and suits everyone. Love your look and how reasonable it is – love that you posted the prices, too. 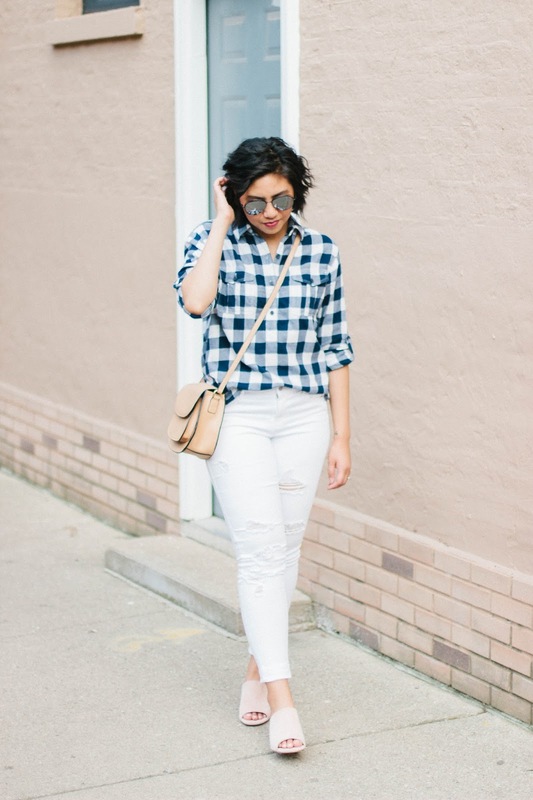 That checkered Buffalo shirt and your mules are awesome. Thanks girl! Sounds like you are also a big fan of wearing white after labor day as well! Can't wait to see your post! Great tips. You look amazing in these white jeans. Love your checkered skirt babe! I don't follow rules! I wore a pair of white pants to work on Friday and was reminded of the no white after labor day rule, I just told her those rules don't apply to me, haha! Love your outfit Rachel, just too cute! Haha I think fashion is the best place to break rules! Thank you so much Brooke! love the shirt ! and the colours ! 😉 perfect outfit ! 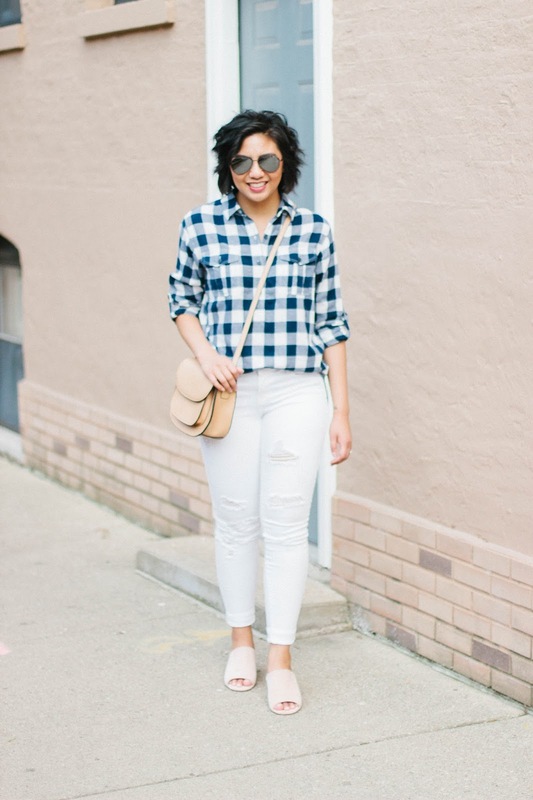 I seriously love wearing white jeans year round – especially in the winter! I love this casual fall outfit! I may do a similar post soon! 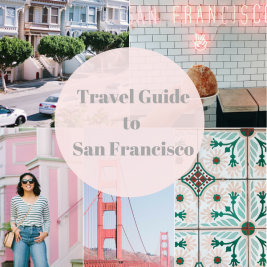 These tips are so wonderful! I love the one of wearing white with dark sunglasses…great idea! Also your outfit is so perfect! 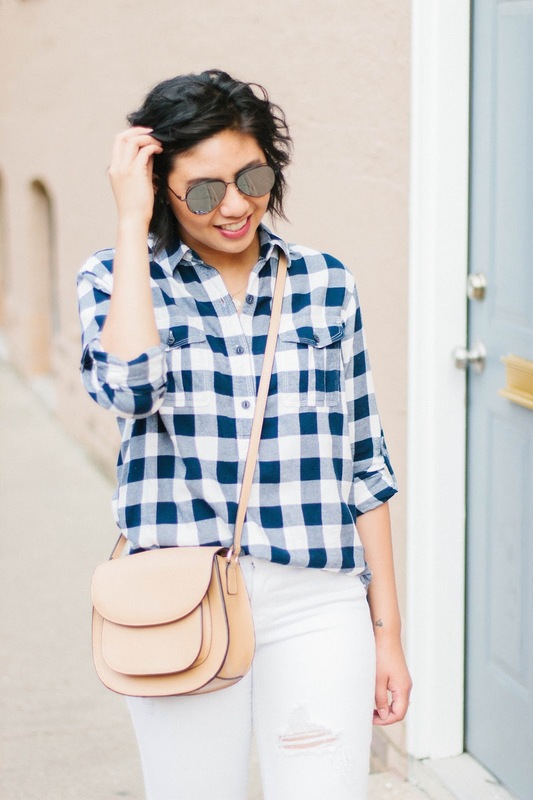 The white jeans with the plaid blouse is beautiful! Right?! I don't know why but it creates a mood! haha! Absolutely love your outfit! It looks so fresh and clean. I don't even care that it's after labor day either! Okay I love this look! Perfect!! Great tips! I totally agree that you can wear white long after Labor Day. 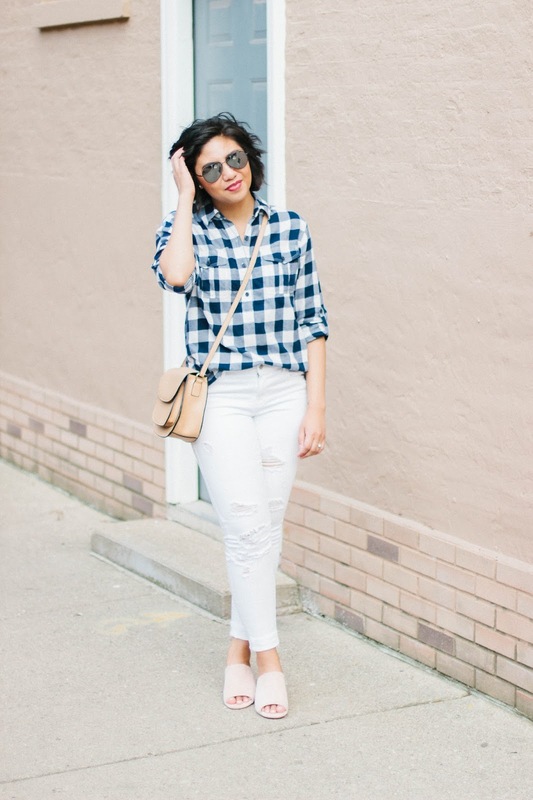 This is a great post-Labor Day white outfit! 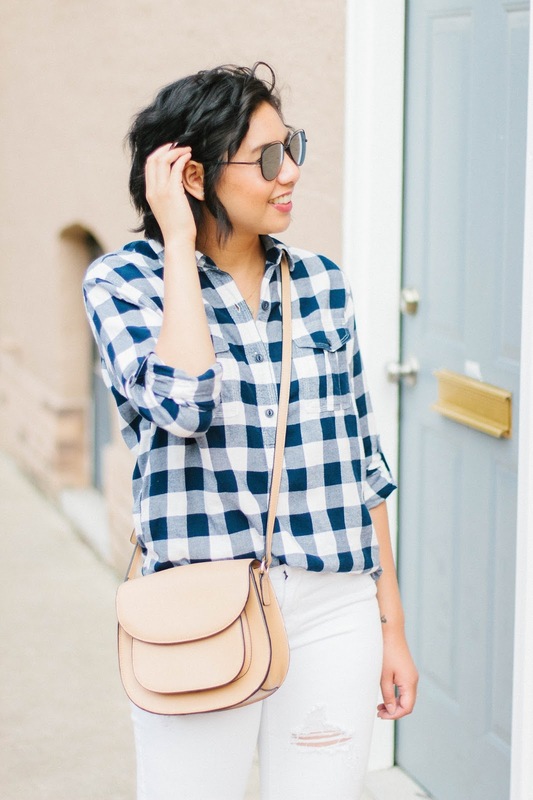 Great casual look, I love white denim! Loving your tips AND your outfit. I'm all for white after Labor Day – truly, all year round! It looks fantastic on you! Hace unos meses publique un look muy parecido, blanco y vichy en azul, con complementos en rosa. Me parece genial. Yes, girl! I also did this! Be comfortable and confident with your fashion style! You look great girl! I don't follow rules — they were made to be broken anyway. LOL! I'm def a fan of wearing white after Labor Day- and you are looking so cute here, babe! Distressed white denim is my jam throughout the year. 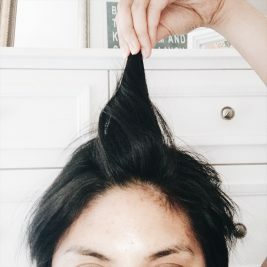 And your hair is looking cuter and cuter every day. Thank you so much Cheryl! This means a lot! Perfect style, I love your shirt. I never had enough courage to wear white, I'm just way to messy. But I really like your style, so youthful, and that purse is really beautiful! Clean and comfort casual outfit! Just my kinda style. Wonderful and the tips are helpful. It's the best! Thanks Kelsey! I wore white jeans yesterday — YES to white after Labor Day! You look adorable. Love the slides!! Such a cute look!! Im all for white after labor day!! Yes, love this so much! White jeans are perfection! I'm always so sad to pack up my white after labor day. But with these tips I might just leave them out! me ha encantado la camisa a cuadros..buena elección! me ha encantado la camisa a cuadros…buena elección! I always love white distressed jeans! They're so easy to style, and makes colors of your top pop. Your Plaid shirt looks sooo comfy. 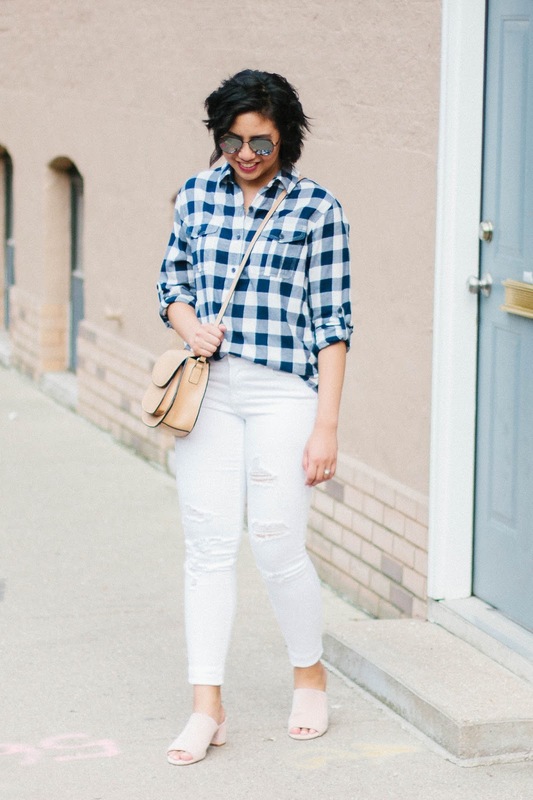 I'm all for white after labor day, especially when wearing denim! I remember hearing don't wear white after Labor Day all that time. Sometimes rules are meant to be broken. Great Post! I am ALL about breaking this rule too! I am so glad others feel the same. Also, I love all the ways you suggested to wear white after Labor Day! I will be taking your advice for sure.